In our research we are interested in the origin of Bilateria as well as the origin and evolution marine invertebrates, specifically small interstitial phyly, at deep taxonomic levels. As the origin of bilaterian animals is within the marine realm these interests complement each other. Traditionally, it had been assumed that the evolution of bilaterian animals progressed from a simple, acoelomate body organization as can be found in flatworms towards more complex forms like the segmented worms (Annelida) with a true secondary body cavity, the coelom. Due to molecular data the phylogenetic relationships of bilaterian animals had been strongly rearranged dividing Bilateria into three major groups, Deuterostomia, Ecdysozoa (the molting animals) and Spiralia (also known as Lophotrochozoa). This initiated a still ongoing debate about the evolution of Bilateria and if it was really from simple to complex or more complicated including secondary reductions. Crucial in this discussion is to investigate the evolution and phylogeny of spiralian taxa. Therefore, in our research we are generally interested in the evolution of marine invertebrate worms at all taxonomic levels, especially Annelida, Nemertea, Platyhelminthes, Gastrotricha and Gnathostomulida. Thereby we are employing phylogenomic approaches based on RNA-seq and shotgun-genome libraries. This allowed us to show in a recent study that the more simple organized spiralian taxa like rotifers and flatworms branch off first in the spiralian tree of life. Hence, our results provide further support for the hypothesis that evolution in Bilateria progressed from simple to complex several times independently. We were also able to improve the phylogeny of Annelida and annelid subgroups substantially in a series of different studies. Hence, we could propose a phylogeny for Annelida, which has been controversially discussed since the recognition of Annelida as a taxon in the 19th century. Annelida split into two major clades, one clade adapted to an errant mobile life and the other one including earthworms and leeches to a more sessile, sedentary one. Both groups together form the clade Pleistoannelida (clade 1 in Struck et al. 2011). 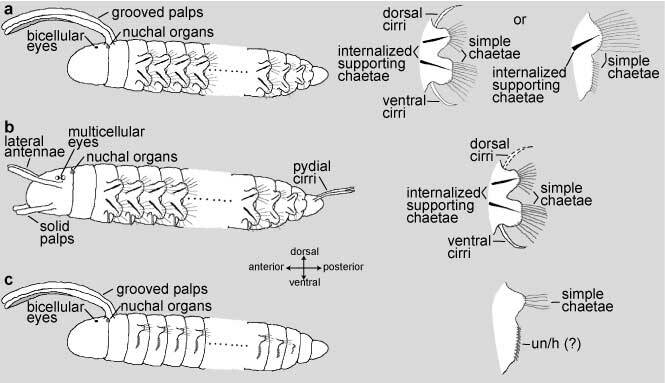 Moreover, the non-segmented Sipuncula (peanut worms) and Echiura (spoon worms) have to be placed within Annelida showing that segmentation is evolutionary much more labile than previously thought. Despite these progresses regarding the position of Annelida and their phylogeny many questions remain open within the phylogeny and evolution of Annelida. Within the intenational "WormNet II" concortium we address outstanding questions in annelid evolution at different taxonomic levels using a multi-tiered approach, which includes phylogenomic approaches based on EST libraries or complete mitochondrial genomes using high-throughput sequencing technologies. 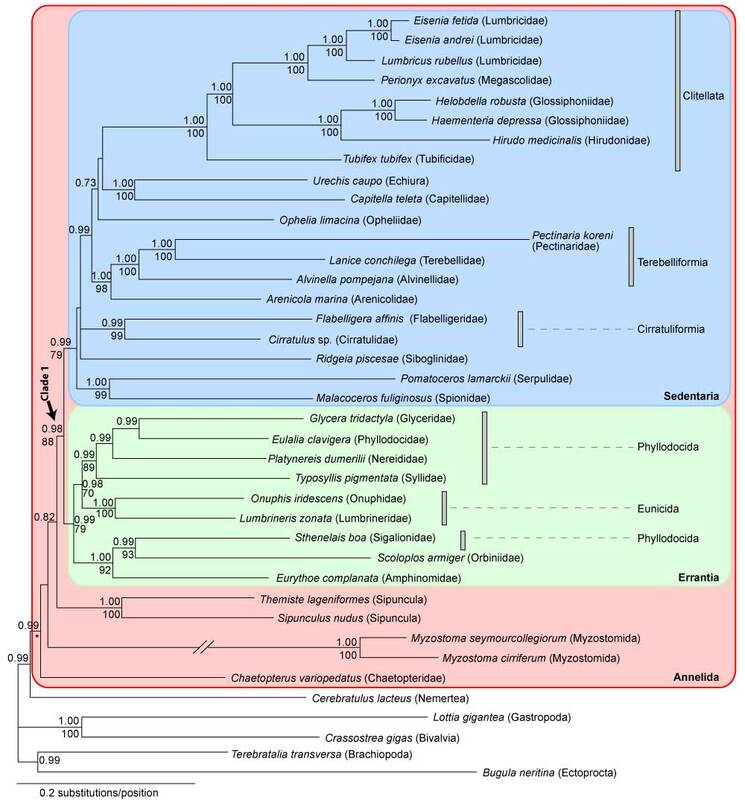 This research regarding the evolution of annelids in general as well as of subtaxa at the order or family level will accompanied by a community sequencing approach of mitochondrial markers to address outstanding questions at the genus and species level. Hence, we will gain insights into different aspects of annelid evolution within annelids, but also with respect to other lophotrochozoan taxa. The tree of annelid relationships based on Struck et al. (2011). Ancestral states of body and parapodial characters for (a) Annelida and Pleistoannelida, (b) Errantia, and (c) Sedentaria. The state of several parapodial characters in (a) Annelida and clade 1 is uncertain, and therefore we depicted the two most extreme possibilities. Dashed drawings or ? indicate that the state of this character is uncertain. Modified from Struck et al. (2011).